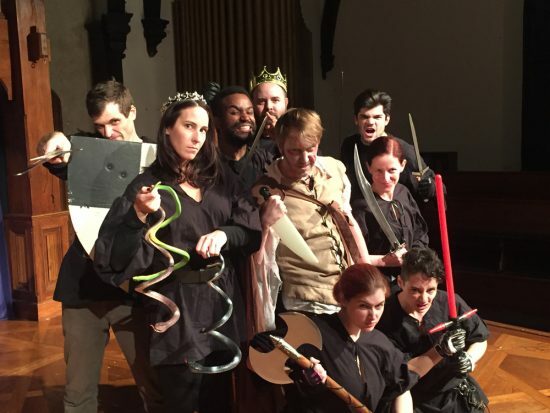 The cast of ‘The Complete Deaths of William Shakespeare.’ Photo by April Forrer. To celebrate the 400th anniversary of William Shakespeare’s death, Cohesion Theatre Company and Baltimore Shakespeare Factory have partnered to present “The Complete Deaths of William Shakespeare: The Remount!” The production highlights 72 deaths from Shakespeare’s plays — everything from the tragedies like Romeo and Juliet to the histories like Henry VI. Sure – at times, it’s kind of gruesome and morbid, but the production can also be “comically serious” or “seriously comic” and is just the thing to get you in the Halloween spirit. Written by Cohesion co-founder Alice Stanley (with a little help from the Bard himself), “The Complete Deaths” highlights all of the staged deaths from Shakespeare’s 37 plays. With a death occurring about every 1.5 minutes, the action is fast-paced (to say the least). However, Stanley’s script pulls the scenes together into a cohesive play which is a pleasure to watch for any Shakespeare fan. If you’re a Shakespeare enthusiast, you’ll delight in this celebration of the Bard’s death-iversary. The production starts off with ‘Zombie Shakespeare’ (Jonas David Grey) addressing the audience – setting the stage for his own plays. William looks ghastly with his tattered clothes and pale complexion (thanks to Costume Designer April Forrer), but he has plenty of enthusiasm and even some humor. At the start of the show, he relates the stabbing of Julius Caesar to the way we want to stab some politicians. The many deaths of “Julius Caesar” are followed by “Antony & Cleopatra” (death by snakes) and “The Winter’s Tale” (death by bear – complete with human bones being thrown on stage after digested). Then comes the histories (and there are a lot of them) – just think about all those poor souls who had to die between Henry IV, V, VI, and VIII. Act II is (unsurprisingly) a lot like Act I. More deaths highlighted from “Romeo and Juliet,” “Macbeth,” and “Hamlet.” However, the production manages to balance the tragic, serious deaths with more lighthearted scenes. While there are emotional scenes like Othello’s realization that he has killed his beloved Desdemona based on lies, there are also scenes of a kind of twisted humor – like when Tamora eats pie made out of the remains of Demetrius and Chiron. The actors turn the gruesome into gleeful, egging each other on to do the next fight scene and getting excited when it is their turn to ‘die.’ The ensemble cast, which includes Zach Bopst, Jessica Byars, Chris Cotterman, Dominic Gladden, Melanie Glickman, Brad Norris, Katherine Vary, and Tegan Williams, should be commended for playing not only a myriad of characters from Shakespeare’s plays but learning some intricate (and maybe even dangerous?) fight scenes. Fight choreographers Tegan Williams and Brad Norris deserve praise for their fast-paced, intricate ‘dances’ of death. The actors deftly use a variety of weapons; the production incorporates everything from swords to roll sticks to daggers and even light sabers (kind of an education on just how many ways there are to kill someone). From the hand-to-hand combat to the secretive stabbings, Norris and Williams’ work has no limits and their attention to detail enhances the show. Fortunately for the audience, Norris is offering an Adult Stage Combat Class, allowing anyone to get out all their frustrations and learn some of the moves witnessed on stage. If you’re a Shakespeare enthusiast, you’ll delight in this celebration of the Bard’s death-iversary. You’ll know all the characters, appreciate the humor, and love all the intricate fight scenes. And if you’re not that boned up on the Bard, Cohesion and Baltimore Shakespeare Factory have so much fun with the production that you can’t help but get swept along – especially when a fairly authentic ‘Zombie Shakespeare’ interacts with the audience, getting you involved in the action. Running Time: Approimently two hours with one 15-minute intermission. “Complete Deaths” only plays through October 31st with a Halloween party featured on the 31st. For tickets, click here.